My newest publication is on the Army shelves now and also on line. It is the DAHSUM, for FY 2007. While not a rivetting narrative due to its structure and format there is still some good info in it, as FY 2007 had some important events in it–much to my surprise when writing it! There was a new Sec. of the Army, Pete Geren, and a new Army Chief of Staff, Gen. William Casey, Jr. The former secretary got fired over the Walter Reid Hospital scandal. “Army Strong” replaced “Army of One” as the recruiting logo. The list goes on. 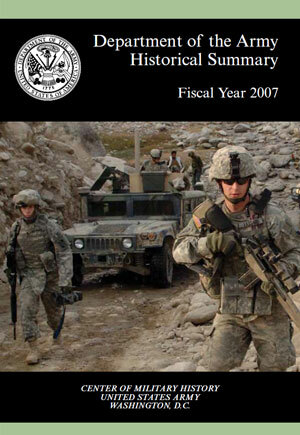 The on-line version is at the website of my employer, the US Army Center of Military History. Also be aware that any indoor pet, such as a cat or dog, may want to drink from your pond and then find himself a healthy treat in the process.